Old construction has a way of making one really feel the history of the place, and I can’t help but envy the walls of ancient cities like Rome. 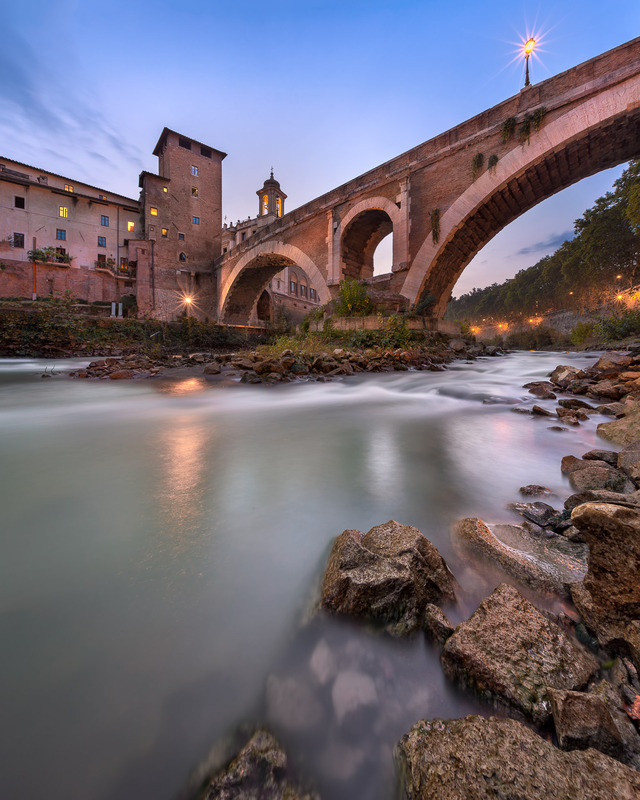 The bridge in this photo, Fabricius Bridge, has stood in Rome for over 2,000 years and still exists in its original state! October 2013, panorama from 2 horizontal images, additional exposures for highlights, focal length 16mm, aperture f/11, shutter speed 25 seconds, ISO 100, tripod. It really does blow the mind to ponder all the characters who walked across this bridge. Think of any historic figure of Rome – Julius Caesar, Octavian Augustus, Nero, Virgil, Ovid, Apostles Peter and Paul, Constantine the Great and many others. Chances are they may have walked across this bridge. Even before the bridge was constructed in 62 BC, a wooden bridge stood in its place. Lucky bridge! I would have loved to see the history of Rome unravel before me, but I guess I shouldn’t push it too far with the personification. Bridges after all don’t have eyes. This area is without a doubt beautiful in a timeless sort of ways, and I arrived with my wife long before twilight to get the perfect shot. The river is surrounded with stunning sycamore trees. I setup beneath sycamore trees to get my shot, and I noticed thousands of small birds begin to perch on the trees above me in the middle of my shoot. How scenic and beautiful – or so I thought when they first landed! Gradually the birds begin to drop little presents everywhere, if you know what I mean. Soon realizing what these drops were, I ran out of the way taking my camera with me. I realized before locals seemed to be carrying around old umbrellas even though it was a sunny day. Obviously it wasn’t for rain, but it was to take cover from bird droppings! Although my shoot was somewhat rudely interrupted by the birds, I still managed to capture a shot! This entry was posted in City and tagged Italy, Rome.